Moonshadows is a popular choice for lunch on the patio or drinks and dinner. 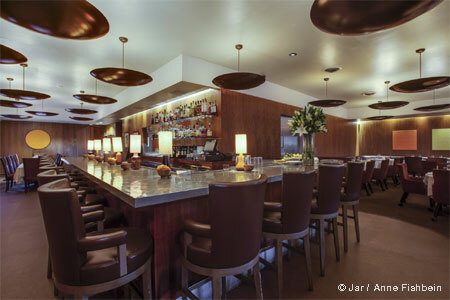 : A complete overhaul of décor and cuisine transformed a faded Malibu institution into a fine dining spot. 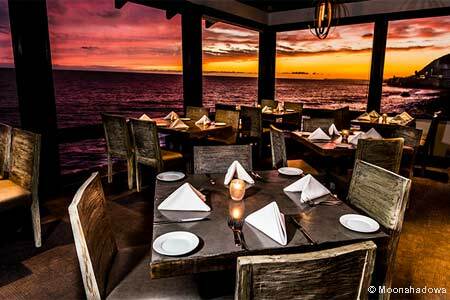 Located right on the beach, every table at Moonshadows boasts a panoramic seascape. As a reflection of the view, the menu focuses on seafood, from beachfront classics to more adult dishes. The cuisine, although not terribly sophisticated, can be counted on to showcase the freshness of local seafood and produce. Items like marinated baby octopus or a classic clam chowder start the meal, while homemade Dungeness crab ravioli and grilled Hawaiian albacore tuna are available as entrées. Desserts include indulgences like strawberry-rhubarb crisp and a Fuji apple pie. On weekends, Moonshadows transforms into one of Malibu's hottest nightspots, where the beach community elite pose on the patio's double lounges, sipping a variety of exotic drinks from clamshell-shaped glasses.